The painstakingly crafted world that J.R.R. Tolkien created for The Hobbit, The Lord of the Rings, and The Silmarillion is so vivid that it's easy to briefly imagine Middle-earth as a real place. From the languages spoken and the creatures that peopled it to the wars and cosmology, the richly imagined Middle-earth has left many artists and fans worldwide imagining what it would look and feel like to inhabit such a wildly inspired world. 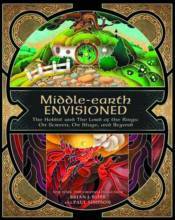 Middle-earth Envisioned is the first book to explore the artistic legacy left by Tolkien's world. Readers will discover details surrounding an attempted Beatles live-action version (with Paul McCartney as Frodo Baggins), a nearly four-hour Canadian musical, the West End stage production of Lord of the Rings, and of course, the Peter Jackson films.